2. Click on the House icon . 3. Open up the Blue Folder that houses your events. 4. Click on the Event icon. 5. 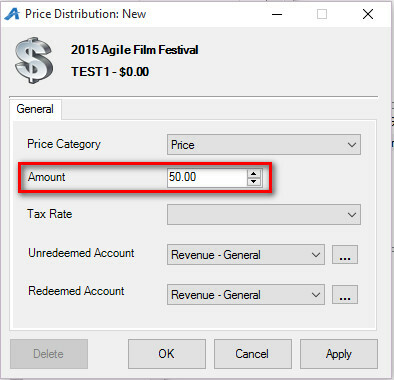 In the Event field, right click and select New. Add the name of the Event in the External Name and Internal Name fields. NOTE: External Name is what will appear on your website and should be the true title of your event. The Internal Name is what will appear in the box office. Enter the Start Date and Time and the End Date and Time. Add the Duration of the Event. Add/select your Distributor (if any). If you are an organization that sends gross revenue for a film to Rentrak, make sure to add a checkmark next to Rentrak. 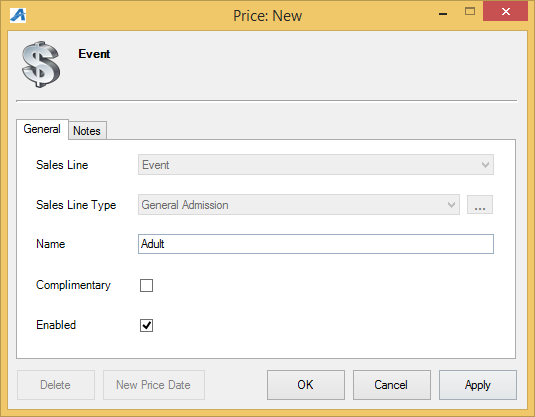 Note: If you need to add a new Event Type or Venue you can select the Ellipsis Button to the right of the drop-down field. Enter in the new Venue or Event type and then select Add New. 8. Delivery Methods allow your customers to choose how they will receive their tickets. Checkmark your organizations Preferred Delivery Methods. Start Days allow you to dictate to the system how many days before the event you would like this delivery method available to the customers. The Cutoff Days tells the system when to turn this option off prior to the event. 9. 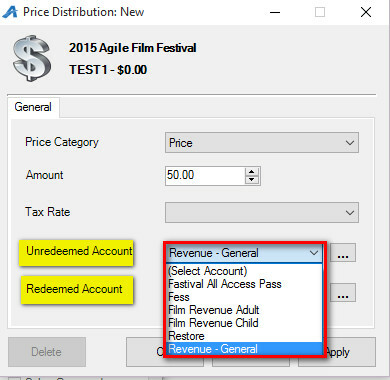 Ticket Verbiage – This is where you can add specific information that needs to appear on the ticket (most ticket formats pull the elements directly from the database, but these fields can be added to the ticket formats if you need special information to appear on the ticket). 10. The Images tab is you will upload still images and video/trailers that will appear on the event page online. To upload an image, click on the Upload arrow and select the image that will become the Main Image and Thumb Image. To add Additional Images, click Add Image . To add a trailer click on Add Trailer and place the YouTube or Vimeo embed link. Click on Preview to finalize the trailer. Check mark Show Event Price Info on Web Sales to show specific pricing information. Checkmark Show Tier Color on Web Sales if you have a reserved seating chart with different price levels. All Seat Selectin on Web Sales should be checked if you have a reserved seating chart and you allow your customers to select their own seats. You can enter in an External Event ID: This can be up to 50 characters long. Select the Ticket Search Type from the drop down menu. The Ticket Search Type allows you to choose how the customer sees ticket informaiton online. 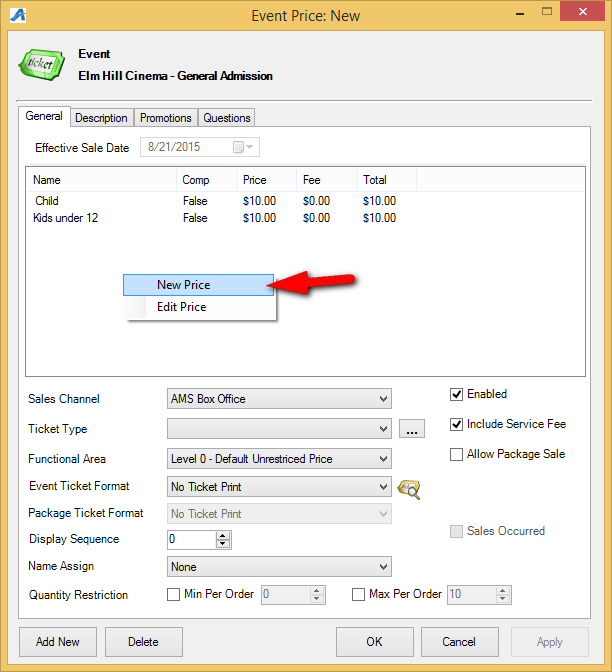 If you are building a General Admission Template(s) you will want to uncheck the box next to Show Tier Color On Web Sales. Checking Show Customer Service Contact Link will allow you to publish a customer service link with Box Office contact information. By checking Display Message at Available Qty a display message will appear when this quantity of tickets has been reached. This is used to indicate a sold out show with specific information or message once sold out. 12. The Web Descriptives tab is where you can add a short description of the event that will appear in a thumbnail tile view. 13. Web Availability is an area that you can put additional information about a sold out performance. (Some Venues use this to give specific instructions on how to get tickets via Rush or Standby Line). 14.The Descriptions tab is where you can add a full description of the show/event. 15. The Confirmation tab allows you to add confirmation text about this specific event that the customers will receive via email confirmation once their purchase online is complete. 17. Included Shorts is generally used by Art Houses and Film Festivals that show short films prior to a feature length film or has a shorts program with all of the shorts bundled into a feature-length show. 18. Once you have filled out all of this information click on Apply to save and OK to exit. 20. In the General, Tab select the Sales Line type and the Tier Name. Here you can also enter in a Zero Available Qty Message that will appear when the open inventory in this tier reaches zero. If you want your customers to be able to see how many tickets are still available, check the Box next to Show Available Qty on Web. Tier Priority is similar to display sequence, orders the tiers online. In the Color box, choose a color for the tier, this is usually used on reserved tiers. A Time Based Tier allows you to associate a certain timer with that tier. If you are ready for you Tier to be put on sale check the enable box. If you are building a General Admission tier please check the General Admission box. In the Initial Default Inventory box enter in the number of seats here, if known. 21. Click Apply to save. 22. An Open Inventory Group appears. If this is the only inventory group needed, then click OK and build the pricing. If you need to add more Inventory Groups right click in the Inventory box and select new. A. If you need to add more Inventory Groups right click in the Inventory box and select new. B. From this pop up you can Name your inventory group something different. You can also adjust the Quantity available for sale from here. 23. Once you have added all of your inventory groups click Apply to save and OK to exit. 24. Next, you will need to add prices. Back on the main event page highlight the event then the Tier/Inventory. In the Event Price section right-click and select New. 25. 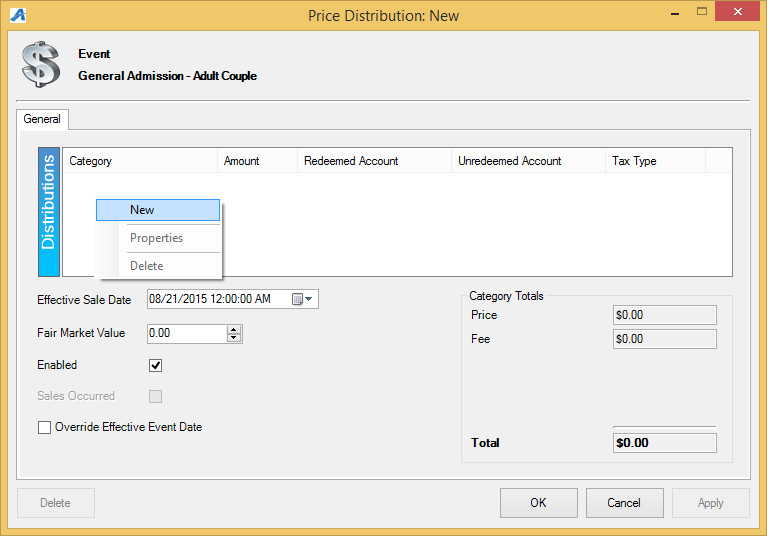 Event Price: New: right-click in the Price box and select New Price. 26. The Price: New window will appear. 27. Click Apply then OK.
28. 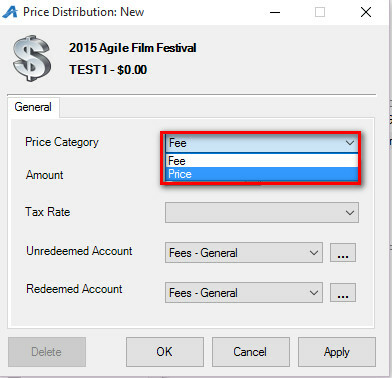 In the Price Distribution: New window right click and select New. -Fair Market Value: enter in the value of the item being sold. Fair Market Value shows up on certain Gross Revenue Reports. 29. Click Apply then OK once all the pricing information has been created. 30. In the Event Price: New window select the price that you just created from the list of prices, and fill out the information below. Ticket Type: This is the name of the ticket that will appear to the customers both online and on their tickets. Package Ticket Format: If this price is bundled in a Package, you can choose a specific ticket format to print. 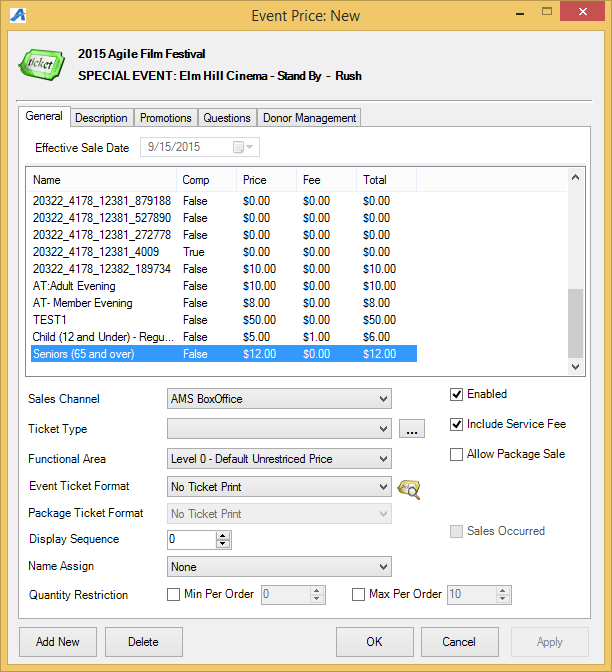 Display Sequence: allows you to determine in what order the list of prices appears on the Box Office screen as well as online. Name-Assign: Allows you to capture names for each ticket (not required). Quantity Restriction: Allows restricting the number of tickets that can be sold at this price per order (i.e. Minimum of 2 Maximum of 8 tickets per order). Please note if you wish to delete an event simply right-click on the event and select delete this will delete the event and all of the Inventory and Pricing.